Successfully Added Computer Tool Bag - Travelers Edition to your Shopping Cart. This convenient tool bag supplies you with everything you need when using your computer on the go. 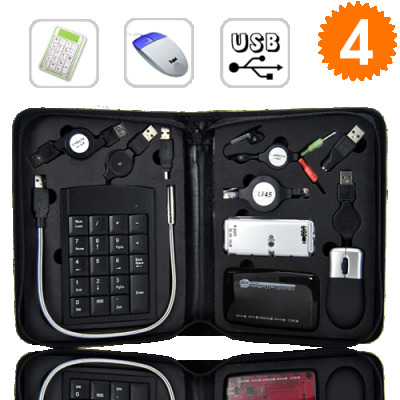 Featuring an optical mouse, slim 4-port USB hub, USB keypad, inspection light, 8-in-1 card reader and 5 other commonly used cables and adapters, you will always have the most popular connectivity accessories by your side, and without the headache of carrying around large travel bags or messy cables with you. Unlike most tool bags, the K58 computer tool bag comes in an ultra compact carrying case, making it quick and convenient to bring with you no matter where your travels may take you. In addition, the K58 is constructed from durable premium grade nylon, and features rigid poly-foam placeholders to securely fit every part of this excellent tool bag. At an unbeatable factory direct wholesale price the CVMW-K58 computer tool bag is the perfect resale item for your online business or retail storefront. Make a great profit or simply buy one for yourself and give a few away as a great gift to your friends, relatives or co-workers. The CVMW-K58 computer tool bag is available right now for single piece or bulk stock orders. Place your order today and we will ship it out tomorrow! Who needs a computer tool bag? Anyone who owns a laptop, netbook or PC, and frequently travels. This is the best way to bring all the necessary accessories with you, and without making a big mess of everything.